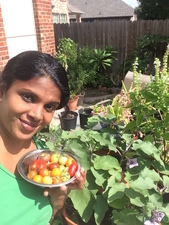 Jeyashree Chidambaram is a Grand Prairie resident that is an avid gardener. She has her own little garden and is a strong promoter of the "Grow Your Own Food" (#growyourownfood) movement. In fact, she is such an agricultural presence that her garden was featured in 'Humans who grow,' a Facebook group dedicated to growing food at home. 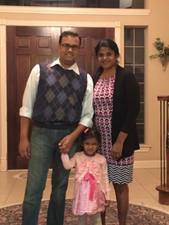 We wanted to learn more about Chidambaram and her story and she was kind enough to answer a few questions we had. Read on to find out more about Chidambaram, as well as a few tips on how you can start your own garden. Tell us a little bit about yourself. Have you always had an interest in gardening? I am an engineer by profession and am currently an entrepreneur. I co-founded Tradier in 2012. I love my day job and the challenges that come with it. My hobbies include gardening, reading and cooking. It gives me immense satisfaction that the food I grow in my garden is often featured at my table when we are eating, sometimes even an entire meal! My husband is a marketing professor at University of Arlington. We have a beautiful 3 year old daughter. Food is a common passion we all share. I heard you were included in the "Humans Who Grow" Facebook group. Can you tell us about that? This is a Facebook group that features home gardeners who grow their own food, from all across the world. 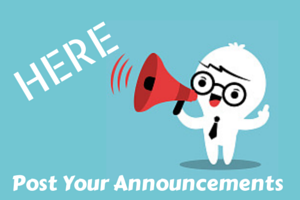 The objective is to share different experiences, challenges and varieties for an equally invested audience. My primary message was that most people can grow their own food. It does not require a huge backyard or ideal conditions. I have a very small backyard and I grow most plants in containers. I am mostly self sufficient between the months of May - Jan/Feb. This message was well received. You are a strong advocate for #growyourownfood. How did that passion start? I grew up in a small town and my dad was an avid gardener. He prided himself in growing almost every vegetable and his flower garden was the best in town then. He would bring new plants every time he traveled to add to his collection and his day would begin and end with the garden. My mom thinks I got his gardening genes -- he is my biggest inspiration. He passed away in 2015 but he is remembered during almost every harvest in the garden. What are some tips you have for someone just starting out (growing their own food)? It took me a couple of years to learn the tricks of gardening in Texas' clay soil and excess heat. 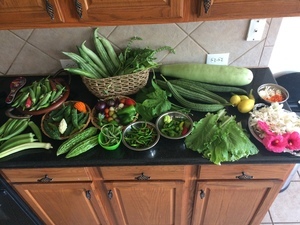 Even though all the hard work in the first two years seemed like a waste of time, this year the garden has really took off and we have excess food that we share with friends and save some for the months ahead as frozen veggies, pickles, thokku, jams etc. Our garden is completely organic and I do a variation of lasagna gardening/composting in the raised beds as I don't have enough space for a big compost pile. My only non-organic gardening are my trials with hydroponics. It has been fun and something I will look into as a permanent feature when I have enough space. My advice to people wanting to grow their own food is to do a bit of research in the plants that fit your gardening zone. That goes a long way in making your efforts fruitful. Also, remember that gardening is a year-long activity. There is always something you can grow in any season of the year. It only takes a bit of research and creativity. We live in a starter home in Grand Prairie with a very small backyard. The previous owners had a lot of trees and shrubs in the backyard leaving very little space for anything else. That didn't stop me from pursuing my passion. I added a few beds and trellises, and a lot more containers and do a combination of both raised bed and container gardening. I love to get my hands dirty and take pride in doing all the work in my garden myself - building the beds, trellises, weeding, lugging in soil, fertilizer, setting up watering system etc. The reward and satisfaction is priceless. My husband and I have dreams and plans about our next garden when we move in a couple of years. The lessons we have learnt, how to make things better and get our little one more involved in the garden. Right now she thinks gardening is fun but green vegetables are for mommy and daddy. My after-retirement plans are centered around gardening of course. To grow more and more varieties and get more and more people interested. And of course, there's always the dream of starting a true garden-to-table restaurant! What's in your garden right now? I love variety in my garden. Rather than grow loads of one or two vegetables I like to grow many different varieties, even if in small quantities. I try different varieties each year. That is what keeps the challenge and fun in gardening. This season I tried nearly 30 varieties of tomatoes, 20 varieties of chili peppers, many varieties of spinach (blooms dale, new zealand, green and red malabar), greens (moringa, ponanganni, purslane, roselle, 2 varieties of kale, arugula, mustard greens, red amaranth, fenugreek), many varieties of lettuces, 3 varieties of mint, 3 varieties of basil, ash gourd, 3 varieties of bottle gourds, ridge gourd, snake gourd, 3 varieties of bitter gourd, tindora, bush and pole varieties of green, purple and yellow beans, sword beans, soy beans, noodle beans, 3 varieties of cucumbers, 3 varieties of okra, 6 varieties of eggplants, ginger, turmeric, betel leaves, red and white onions, 3 varieties of radish, garlic, bunching onions, leeks, brussel sprouts, cabbage, kohlrabi, 4 varieties of beets, 2 varieties of carrots, pea shoots, colacasia and purple potatoes. Also added to our super food collection are longevity spinach and mayan spinach. I also grew strawberries, blackberries, blueberries, honey dew melon, orange, fig and guava. Our daily requirements of curry leaves and cilantro leaves also come from our garden. 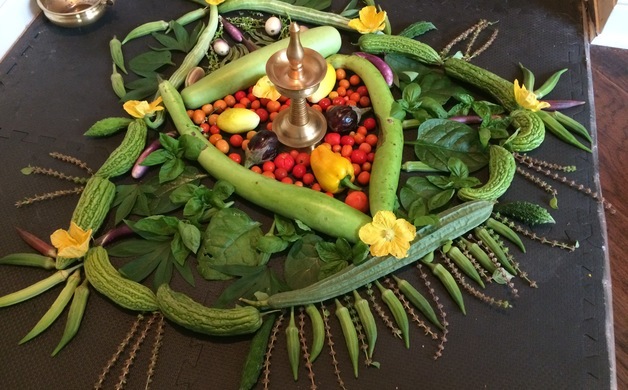 We love to serve food from our garden to guests, in banana leaves from the garden followed by sweet paan using paan and gulkand made out of roses from the garden. I also maintain a small collection of flowers mostly tropical with many varieties of jasmine, hibiscus, plumeria etc. Our tower garden has been providing daily salad from March-December. Are you involved in any community groups? I am part of a community group engaged in winter sowing and tried it for the first time this year to great success. I actually had to give away a lot of seedlings because of the success rate. This keeps me busy in winter months. I also trade hard-to-obtain heirloom seeds in various groups. I am an avid proponent of growing your own food and eating what is in season. Space should not be a constraint. I also collect and give back seeds to the Dallas seed library, focusing on Asian vegetables bringing more awareness and availability of the same. I maintain a Facebook page 'My Garden to My Table' and share my experience in the garden with the rest of the world. It gives me the opportunity to share with others both my passions of gardening and cooking. The main focus is how I try to make parts of or an entire meal using vegetables from my garden. I also share my knowledge on how to preserve veggies, how to grow more prolific varieties and food art. I also improvise and add new recipes based on what my garden provides. I hope that it will bring interest to more people to grow their own food, healthy eating, share knowledge and keep the earth green.